Standard Bunk: $675.00 per person; includes all meals. Spend a weekend away from all the distractions of everyday life and embark on a true adventure. 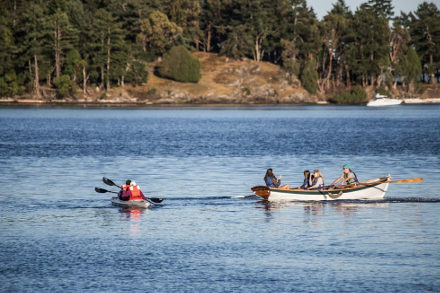 Leave electronics behind as you work together as a team exploring the San Juan Islands by sail, kayak and foot. 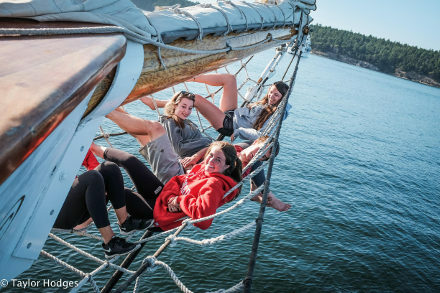 Passengers and crew will join together every morning to raise the largest mainsail on the west coast of the United States and engage in sailing maneuvers as we meander throughout the San Juan Islands. Occupy a cozy standard bunk or a private stateroom aboard the largest classic sailing vessel in the region. The cruise is structured so passengers have the option of learning sailing stations, the basics of navigating, steering the ship and standing watch. By the end of the trip passengers can feel that they are a part of the crew.